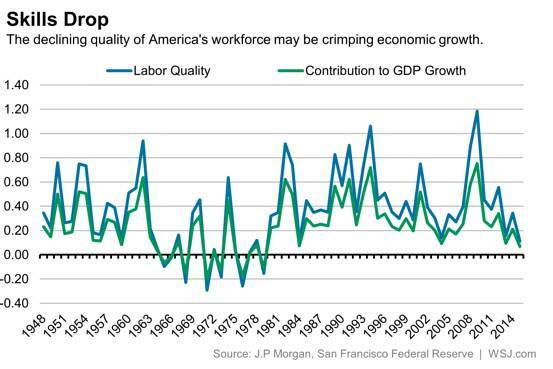 Theories abound as to why U.S. productivity growth has stalled. Economists attribute it to everything from a slowdown in business investment to inadequate measurement techniques that fail to capture efficiency gains from new technologies. A recent research note from J.P. Morgan Chase offers another theory: It’s at least partly because the American workforce as a whole is simply less skilled than it used to be. That matters because productivity growth drives wage growth, which by some estimates has stagnated for most of America’s workers. 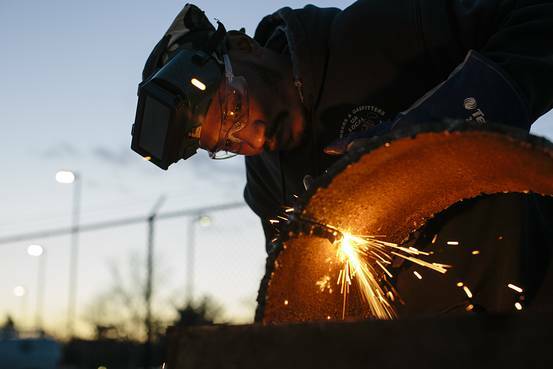 Growth in “labor quality,” a measure of the skill set of the average worker, has declined in the last few years, according to the report. In 2015, the growth in overall workforce skills contributed less than 0.1 percentage points to GDP growth, the smallest contribution of labor quality to growth since 1979. Michael Feroli, the author of the note, estimates that contribution will remain below 0.1 percentage points for the next few years. Compare that with previous decades: In the postwar era through 1980, growth in labor quality contributed 0.25 percentage points to GDP growth each year. From 1980 to 2005, that contribution rose to around one-third of a percentage point. “That may not sound like a big deal, but with trend growth as low as it is, every basis point counts,” Mr. Feroli said. Some of the decline is cyclical. In recessions, labor quality tends to rise, as the job market sheds the least-productive and least-educated workers first. As the economy expands, those laid off return to work, sometime with more education, but often with skill sets that have deteriorated in the interim. Longer-run trends are more worrying. Well-educated baby boomers are retiring, and many laid-off older Americans who want to work have struggled to find jobs following the recession, bringing the overall experience level of the workforce down. College enrollment is on the decline after peaking in 2011, as the economic expansion creates job opportunities for less-skilled workers.